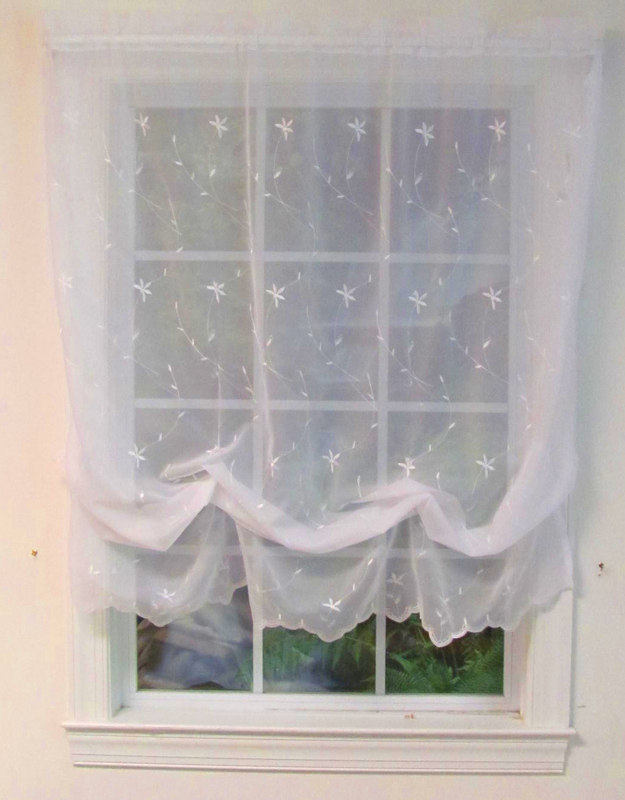 Dimensions: 54"W x 63"L and 54"W x 84"L.
A voile sheer adorned with an attractive overall vining embroidered design and further embellished with a scalloped embroidered finish on bottom edge. Tailored panels are 55" wide and are available in 63" and 84" lengths. Panels are sold separately, and have a 1 1/2" rod pocket 1 1/2" header, and 1/2" side hems. One panel per package, matching valance is sold separately. Machine wash gentle cycle warm water, tumble dry low heat, warm iron as needed. A voile sheer adorned with an attractive overall vining embroidered design and further embellished with a scalloped embroidered finish on bottom edge. 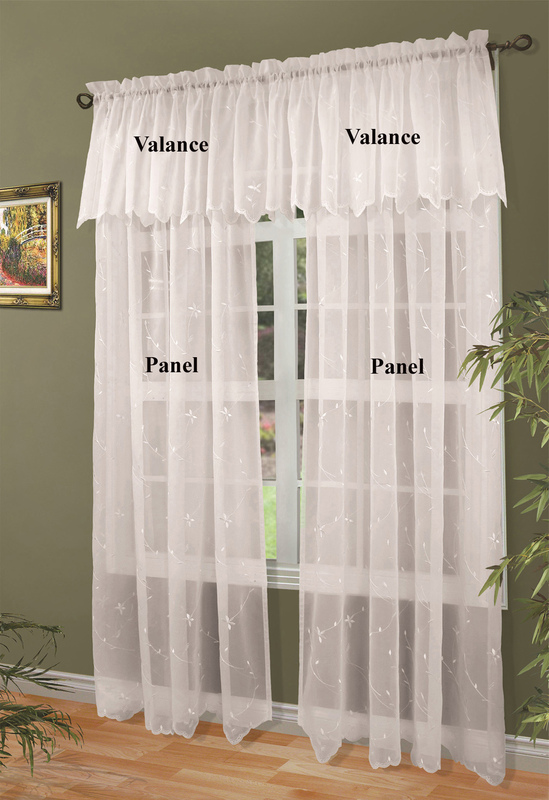 Tailored Valance has a 1 1/2" rod pocket 1 1/2" header, and 1/2" side hems. Voile sheer adorned with an attractive overall vining embroidered design and further embellished with a scalloped embroidered finish on bottom edge. Four columns of adjustable rings to display the curtains in four lengths. Scalloped bottom edge, 1.5" rod pocket, 1.5" header. Roslyn is a voile sheer adorned with an attractive overall vining embroidered design and further embellished with a scalloped embroidered finish on bottom edge. Tailored panels are 55" wide and are available in 63" and 84" lengths. Panels are sold separately, and have a 1 1/2" rod pocket 1 1/2" header, and 1/2" side hems. 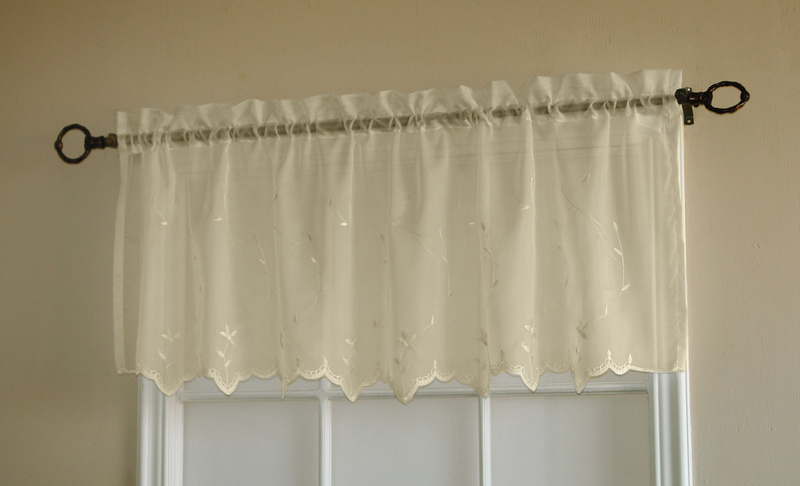 The Tailored Valance also has an embroidered scalloped bottom, 1 1/2" rod pocket, 1 1/2" header with 1/2" side hems. Colors: White, Ivory, Aqua, and Sand. Use a one inch standard rod for hanging.